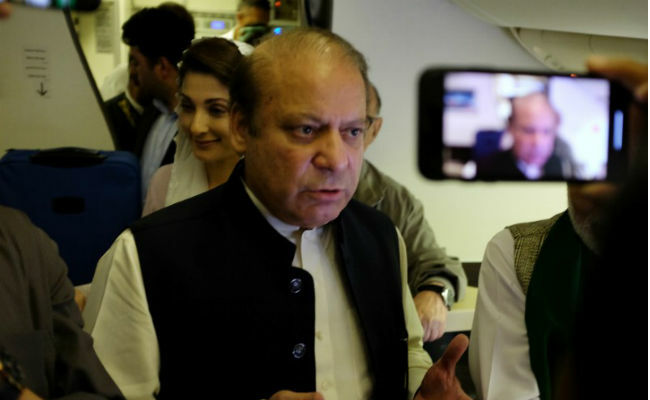 Ousted Prime Minister of Pakistan Nawaz Sharif fell ill on Sunday as he suffered from heart and kidney problems and a medical team recommended that he be shifted to a hospital. A jail administration official told Dawn that the medical team, led by retired General Azhar Kiani, visited Adiala jail and after medical check-up said Mr Sharif needed to be hospitalised for immediate treatment. He said the heartbeat of the former prime minister was irregular due to dehydration and the presence of urea in blood might affect his kidneys. He said the medical team’s recommendation had been sent to the Punjab health secretary and the caretaker government. “The government will take a decision on it,” he said, adding that the team had been called after the former prime minister complained that he was not feeling well. The official said that a separate medical team from the district headquarters hospital conducted a medical check-up of Mr Sharif’s son-in-law, retired Capt Muhammad Safdar, as he was suffering from ear and throat infections. Gen Azhar Kiani, the chief executive officer of Rawalpindi Institute of Cardiology and former commandant of the Armed Forces Institute of Cardiology, was physician of former president retired Gen Pervez Musharraf.